Vertical Mailboxes are the ideal solution for small apartment complexes, small office locations, and low density multiple tenant buildings. These mailboxes are available in configurations of three to seven compartments and are typically located in common areas or specific buildings in an apartment complex. 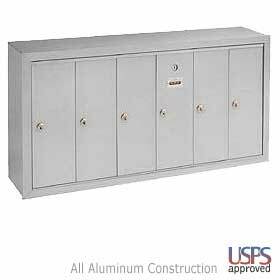 For larger apartment complexes a group of mailboxes can be installed next to each other in a common area. These mailboxes are the 3500 series, model 4B+ and they have been United States Postal Service (USPS) approved for the required security upgrades of USPS-STD-4B+ regulations. They are approved for replacement and / or retrofit applications, however, they are NOT approved for new construction or major renovations. Another mailbox model would apply to the latter situation. Our Vertical Mailboxes are made of 100% durable, heavy gauge extruded aluminum and protected from corrosion and oxidation by a powder coating. The powder coating is offered in five attractive colors that include aluminum, brass, bronze, sandstone, and green. The building owner has several mounting options to choose from. The mailboxes may be surface mounted on a wall or on a flat surface. And they may be recessed mounted in any wall opening of appropriate size. Mounting hardware is not included. These mailboxes can also receive mail from either the United States Postal Service or from a private individual. All of the compartments in our Vertical Mailboxes are 5 1/2 inches in width, 16 1/4 inches in height, and 6 3/4 inches in depth. All of the doors include a five pin cylinder cam lock with two keys. In addition, the doors feature an indentation of 2 1/2 inches in width and 5/8 inch in height for placement of a label with identifying information of the tenant. The three compartment mailbox weighs twenty-five pounds and the seven compartment mailbox weighs forty-five pounds. Our Vertical Mailboxes have a number of optional features to help meet the needs of the customer. 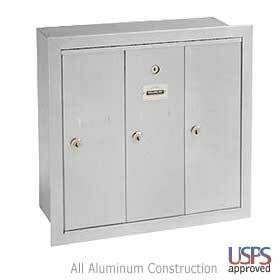 All mailbox units can be ordered with a compartment with an outgoing mail slot. It is almost identical to the other compartments, except it has a slot for the tenants to deposit outgoing mail. The slot measures 4 3/8 inches in width and 1/2 inch in height. Unless otherwise specified, this outgoing mail slot will be located on the far left side of the unit. If a mail slot is being ordered, then the number of compartments in the mailbox should have one more than the number of tenants receiving mail. The mailboxes can also be ordered with a master commercial lock (with two keys). The mailboxes offer a master door security retrofit kit. Additional keys per lock and key blanks are available. A letter box can also be added to the mailbox unit. It is a larger box that can hold outgoing mail and smaller packages. More information is available upon request. And should the building owner choose to add a bit of elegance to his / her mailboxes then custom identification systems are available. These engraved placards are custom engraved and self-adhesive. This article was published on Thursday 25 February, 2010.